The spinal cord is a major bundle of nerves that carries electrical impulses to and from the brain to the rest of the body. It is about as big as your index finger, and descends from the brain down through the hollows of the spinal column, or rings of bone that are called vertebrae. These bones are very strong and flexible, and protect the spinal cord from injury and trauma. If you or a loved one has suffered an SCI, call Zinda Law Group at (800) 863-5312 for a 100% free case evaluation with our San Antonio spinal cord injury lawyers. Spinal cord injuries can vary depending on the type of injury, the level involved, and the severity of the injury sustained. There are two types of spinal cord injury: complete and incomplete. A complete injury results in the loss of all ability to feel and move below the level of injury, and an incomplete injury may result in some functioning below the level of injury. The Foundation for Spinal Cord Injury cites the most prevalent cause of spinal cord injuries in the United States result from vehicle accidents. These types of accidents account for nearly 42 percent of all spinal cord injuries. Regardless of whether you suffered a complete or incomplete spinal cord injury, the injury is a very serious and life-altering event, often making it impossible to return to work or a normal lifestyle. People with spinal cord injuries often suffer long-term or life-long disabilities and monumental medical and care giving expenses. 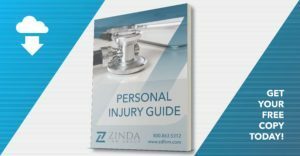 At Zinda Law Group, our San Antonio spine injury attorneys have helped victims recover compensation for medical bills, loss of income, pain and suffering, and much more. We have the knowledge and skills necessary to help you build the strongest case possible and pursue maximum recovery for all the ways your injury has cost you. Our firm also operates on a contingency fee basis, which means you pay nothing unless we achieve a favorable settlement, judgment, or verdict for your spinal cord injury case. That's our No Fee Guarantee. If you or a loved one has sustained an SCI, call Zinda Law Group at (800) 863-5312 for your free consultation with our San Antonio spine injury lawyers.